Learn more about what images sizes work best in your Modern Editor email design. What size are the image areas in Modern Editor? Image sizes in Modern Editor vary depending on the space the image is placed in. 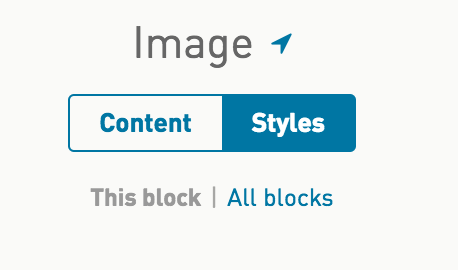 Image blocks in Modern Editor will accept any image uploaded into the space. This makes image areas very flexible for the image files you have to work with in your design. In general, follow this rule for your image sizes: heights can vary, widths should be the largest width the image will be on desktop display. When you want side by side images in Two or Three-Columns to align, make sure the image heights match before uploading the images into the space. 4. Inside the Block Container, update the max width. Option 1: You can remove full-width class for images when you want your image to stay the uploaded size, regardless of the design's responsive changes. 2. In the 'class' field, remove full-width. Or, Option 2: Use text blocks instead of image blocks to upload images that are specific sizes. 1. Click on your text block area from the preview panel. 2. Place your cursor in the text area where you would like the image to go. 3. Click on Add > Image. 4. You can either paste in the image URL in the src field or you can click Browse media to select an image from the media library. Click I'm Done when you are finished. Enter your alternate text in the 'alt' field and your redirect link in the 'href' field. Best size for uploaded images. It’s always best to upload an image that is larger than the area you are uploading it to. This way the image will look great on any device that loads the design. As a general guideline, use 800px width (for your largest images); feel free to adjust for smaller image areas. You can upload images that are smaller in height than the default space. 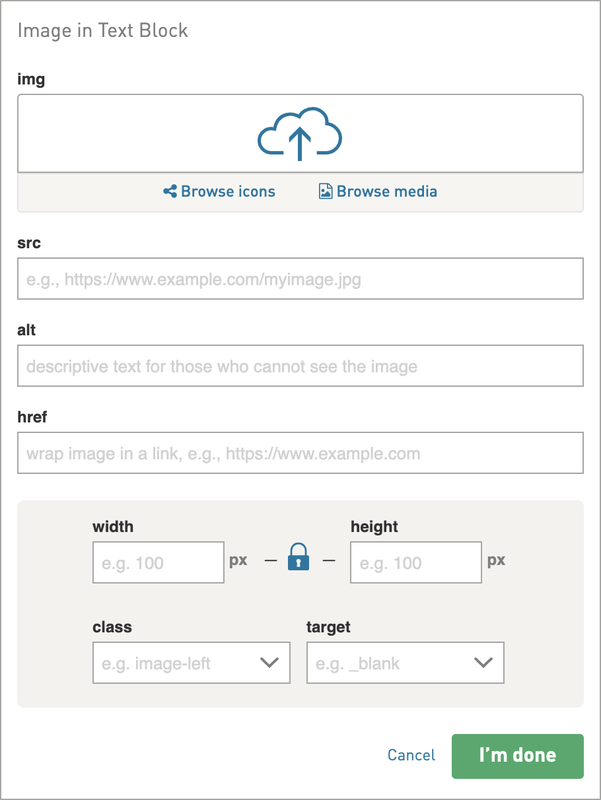 WordFly will adjust the size of the image to fit the space you are uploading it to. The latest Apple devices use Retina Displays, which means double the amount of pixels are packed into an image to make it look as crisp and lifelike as possible. A retina image requires uploading an image that is double the size of the space it is occupying. Let's review how to upload retina images in Modern Editor designs. Upload an image that is at least twice the width dimensions. For example, if the image is being uploaded into an 800px wide space, upload an image that is 1600px wide. WordFly will resize it for this space and the extra pixels will make it look great on retina displays. Click Add > Image. Select your image from the Browse Media link or insert your image URL directly into the src field. WordFly will automatically insert the width and height of the image. Adjust the settings for width and height to half. Click I'm Done. The image will be inserted at exactly the size specified. Double-click on the image to go back to the edit window. Images uploaded into text blocks are always fixed width by default and not responsive. Uploading an image that is double the size of the area means the device opening the design will require more bandwidth to download the image. This means more data usage on mobile devices and could result in slower image download. Take this into consideration before uploading retina images.